Over the last 30 years ballistic body armor has saved the lives of over 3,000 police officers in the United States alone. Recent studies by the Police Executive Research Forum (PERF) show that law enforcement personnel not wearing body armor are 14 times more likely to die of a fatal injury. A study published in the Journal of Occupational and Environmental Hygiene found that officers who do not routinely wear body armor are 3.4 times more likely to suffer a fatal injury from a torso shot than officers who are properly equipped. The evidence is clear; body armor saves lives. The materials used by manufacturers of ballistic protective equipment have improved enormously over the last few years, enabling the design of ballistic vests that offer higher levels of protection at a much lower weight. Computer modelling has produced new ergonomic designs providing a more comfortable fit. Use of the latest high performance textiles eliminates most of the difficulties associated with wearing a ballistic vest. Moisture wicking fabrics keep the wearer cool and dry, even when wearing a vest for extended periods of time in hot climates. EnGarde® is proud to have served ten thousands of clients worldwide since 2003 and offer them the highest quality concealable and tactical body armor. The National Institute of Justice (NIJ) first began testing and producing body armor (safety vests) and performance criteria for ballistic and stab resistance during the mid-1970s. And, since that time, the lives of more than 3,000 officers were saved. This NIJ standard is widely known and accepted by police agencies all throughout the world. Thus, the standard is the performance scale for all ballistic-resistant bulletproof vests. Understand, as it stands, there are currently no bulletproof vests available on the market. Body armor does give protection to the wearer from various kinds of handgun ammunition. However, officers should always remember that armor’s threat level is classified and rated differently. When certain officers – Special Operations officers, hostage rescuers and SWAT team members – face a weapon threat that is greater than regular body armor can provide, they should wear additional protection. The NIJ standard lays out what the minimum requirements are for performance and testing methods for all personal body armor and rates the various kinds of available body armor and notes the many threat levels. When body armor is being tested, self-regulating NIJ-certified laboratories will put the body armor through various tests to ensure they are up to NIJ code and performance standards. The NIJ has the authority to retest body armor already on the manufacturer’s floor to ensure performance standards are up to code as time passes. This is part of the NIJ’s excellence and audit procedure. Their performance standards means commercially available body armor will meet the minimum performance requirements it sets forth. 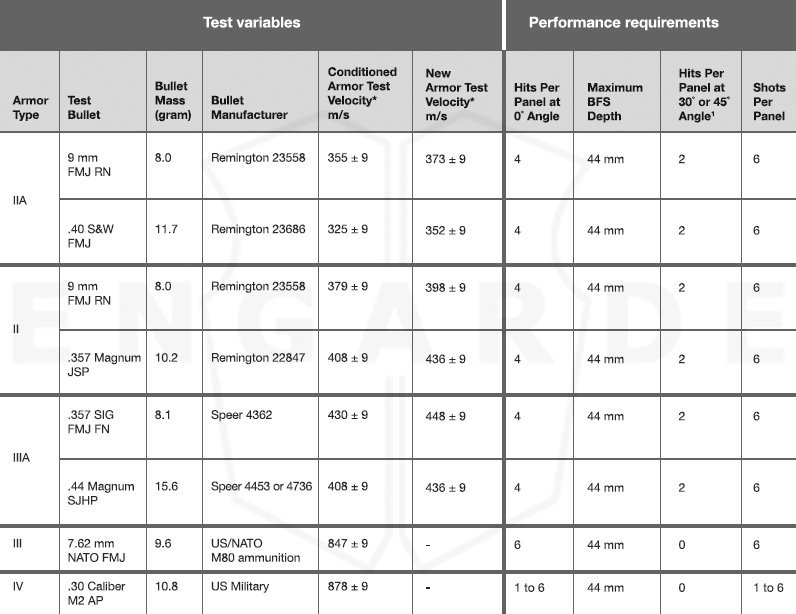 In fact, personal body armor’s ballistic and stab resistance standards have been published by the NIJ. An overview of both the NIJ 0101.04 Standard as the NIJ 0101.06 Standard can be found below. All armor panels (including carriers) will be sprayed during three minutes on both sides before testing.